Tickets include light refreshments and entrance to the exhibition Dreaming the Universe: The Intersection of Science, Fiction, & Southern California starting at 5:30 pm. Tickets: Members $10; General $15. Advanced ticket purchase is recommended, visit https://octaviabutlerlecture.brownpapertickets.com or call 1.800.838.3006. 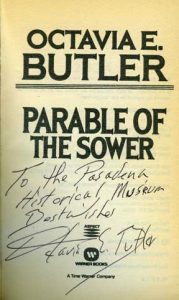 Image: Inscribed copy of Parable of the Sower by Octavia E. Butler, 1995, Research Library & Archives.